Need an experienced geyser plumber to solve all common geyser problems in the following areas? This is a common call that we at Drain Ratz receive almost everyday at the plumbing division.This gives us an understanding that the following has happened: Your geyser has burst, or a major leak has developed from the geyser, or the overflow system is not coping or there might be a drip tray problem. Immediately switch off the power supply and the cold water supply to the geyser. Switch of the geyser power at the DB board. Call Drain Ratz plumbers to assist you with your water leak. Sometimes its easy to neglect the obvious and spend hundreds of Rands on electrical and plumbing bills. If there is no hot water, first do the following. Check whether the geysers circuit breaker on the main db has been switched off. Try resetting it only twice. If it continues tripping, then only call an electrician. 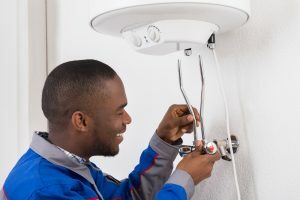 Once the power supply has been checked and you still experience , no hot water, then the heating element or the thermostat of your geyser has failed. Call Drain Ratz plumbers to assist you. There is not one reason to pin point for this problem of hot water pressure being very poor. There are various factors relating to this. Most common factor is old galvanised pipes, dirty or blocked valves. Another reason can be that the geyser itself is a low pressure geyser. Low pressure geysers were very common in old homes and it only went up to 100 kpa instead of the new homes of up to 600 kpa. Low pressure geysers usually have spherical “Lacto” valves in place of the modern pressure balancing valves. Why we say that this is an important factor is because, a pressure balancing valve, fitted on the cold water supply to the geyser, ensures that both the hot and cold water supply to the bathrooms are at the same pressure rating as the high pressure geyser. When you are experiencing this problem, there can only be 2 reasons for this. The thermostat and heating element. The thermostat could be too low or it could indicate that the thermostat and element is not working. Reset your thermostat to 65 degrees. IF this does not work, replace your geyser. It could mean that your old geyser is no longer working correctly as a heating tank and that the geyser has somewhat become calcified. Geysers often leak (drip) through the pressure control valve overflow pipe. This is normal as the water in the geyser heats and cools. However, anything more than a few litres a day usually indicates that the pressure control valve is faulty. This valve should be replaced if there is a constant steady drip from the overflow pipe. An occasional dripping after water has been drawn from the geyser is fine. Geyser thermostats are specially made to fault in the open or “off” position. If the thermostat does this the the water in the geyser obviously ceases to heat. However, sometimes the thermostat faults in the “on” position, in which case the water will eventually boil and the geyser may explode. An indication that this is occurring is when hot water and steam is observed coming out of an overflow pipe. This escaping hot water and steam shows that the temperature and pressure valve (TP valve) is releasing hot water because excessive temperature and pressure is building up in the geyser. The most common cause of overheating is a faulty thermostat. This is potentially very dangerous and must be seen to immediately. Switch off the geyser and call Drain Ratz plumbers. Geysers often leak or drip through the pressure control valve overflow pipe. Water in the geyser heats and cools down so this occurrence is normal. If your geyser continually drips and it is more than a few litres a day will indicate that there is a serious pressure control valve problem. This pressure control valve must be replaced if there is a constant steady drip from the overflow pipe. An occasional dripping after water has been used in the geyser is regarded as normal. 8. Geyser Problem: Geyser is overheating, I can see steam. This call makes me very worried. Switch off your geyser immediately and call Drain Ratz. Faulty thermostats are the most common cause for overheating geyser. Must be seen to immediately. When we speak about geyser thermostats, we speak about “faulting in open or off position”. Geyser thermostats are specially made to fault in the open or “off” position. If the thermostat does this the the water in the geyser obviously ceases to heat. Sometimes the thermostat faults in the “on” position. This is extremely dangerous as the water can over boil and the geyser will EXPLODE!! When you see hot water and steam coming out from the overflow pipe, be careful. This is a warning that the temperature and pressure valve is releasing hot water because of the pressure and temperature build up in the geyser. Faulty geysers can be very disastrous for any home.If you have an improperly installed hot water geyser call Drain Ratz and we can correct it for you to SABS standards. The most dangerous fault is the lack of the a 20mm metal overflow pipe fitted to the temperature and pressure valve. The temperature and pressure valve (T&P valve) should be connected by a 20mm meal overflow pipe safely to the outside to prevent boiling water flooding through the ceiling. For an analysis of your geyser, contact Drain Ratz Plumbers before it may be too late. All the above applies as he geyser tank is still used as a heating tank. The only difference is hat most of the solar ready geyser are backed by the manufacturer warranty more so now then any normal electric geyser. The idea behind the solar ready geyser is to allow homeowners who has a vision to change to solar in the near future, an opportunity to have this solar ready geyser installed. Prior to this normal electric geysers were retrofitted to solar panels . Save now, install a solar ready geyser. This will also allow your solar installation in the future to be cheaper as 1/4 of the hard work of the installation is already done for you.As more and more people are accepting the idea of solar ready geyser, it just easier, more practical to install a solar ready geyser now. With Eskom’s “no more rebate programme”on any geyser, may it be solar or electric,or heat pump, many more people are deciding against the solar factor. We have to however change our mind set as we are moving in an era of green plumbing and any preparation now will be less an effort in the future. We also have to consider Eskom’s burden to supply energy to every household on a 24 hr basis. There will be more and more power cuts in the future and renewable energy like these solar ready geysers is a step in the right direction. Drain Ratz Plumbers & Builders are professional geyser installers installing all manner of Geysers. Give us a call today.